This is a picture taken during Teal Sounds' performance on June 24, 2006, in Columbia, S.C., during Carolina Crowns' FirstBeat. 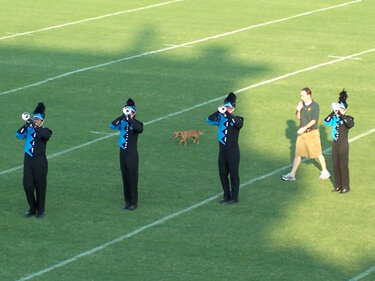 A dog got loose during their performance and trotted along on the field. It was funny, but they finally got the dog off of the field. Most people thought the dog was enjoying their performance.